Swanston Glass And Windows have provided a comprehensive range of glass and glazing services since 1948. We supply and fit Upvc Windows and Doors To Commercial Premises. We supply and fit replacement double glazed sealed units, so if you require your misted up double glazed sealed units replaced, please do not hesitate to contact us. We offer a glass cut to size service, normally while you wait, and we keep a large range of Pilkington Glass in stock. We really do offer practically everything you could want from a leading glazing company including a comprehensive supply and fitting service. 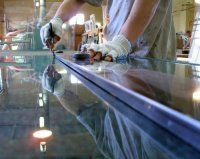 So whether you need some safety glass for your shop window or some specially cut glass for a traditional window, we are more than happy to be of assistance. Saturday: 9am-12pm !PLEASE PHONE 01202 475465 to check that the shop is open before coming as sometimes it is closed due to emergency window repairs! So whatever you need when it comes to glass cut to size, broken windows repaired, Upvc windows and doors or any other glazing work you may require , we are the company to call. For all glass cut to size, upvc windows and doors, safety glass, mirrors, double glazing sealed units please call Swanston Glass And Windows in Christchurch, Bournemouth, Highcliffe, Ringwood, New Milton, Poole areas.